DENVER, Aug. 24, 2017 /PRNewswire/ -- DaVita Kidney Care, a division of DaVita Inc. (NYSE: DVA) and a leading provider of kidney care services, will host a first-of-its-kind National Veteran Interview Day on Sept. 19, 2017 from 2-6 p.m. local time at eight DaVita business offices located across the U.S. Veterans may also interview virtually via phone. Since 2010, DaVita has hired over 3,000 veterans, offering transitional support for teammates with a military background. The hires vary from patient care technicians to the organization's chief development officer. In that same time frame, DaVita has received 28 awards for exceptional recruiting outreach in the veteran community. In 2013, DaVita was honored to receive the Freedom Award from the Department of Defense, the highest recognition given to employers for exceptional support of Guard and Reserve employees. 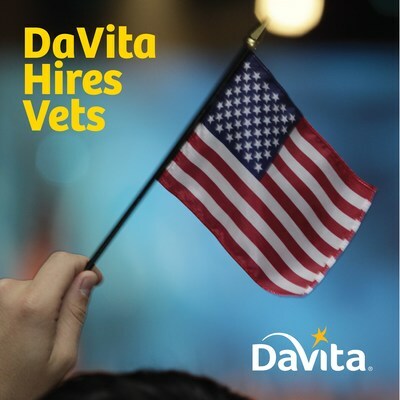 "We are privileged to have many veterans, current members of the Guard and Reserve, and military spouses as part of the DaVita community," said Kent Thiry, chairman and CEO of DaVita. "Our teammates from the armed forces share our core values and we look forward to growing their presence in the Village through this hiring initiative." DaVita cares for active service men and women and strives to provide assistance to our veterans as they transition from life in the military to life as teammates in the Village. Workshops and development courses are offered to help foster a stronger community for new veteran teammates. The Veterans 2 Village (V2V) is a two-day class introduced in 2016 that focuses on self-development and introduces new veteran teammates to DaVita's existing military programs and benefits. Veteran Guides help facilitate the V2V live course. DaVita's internal veterans' programs are designed to foster a stronger community for new veteran teammates, as the company's support services continue to develop and grow. Veterans are encouraged to register for a virtual or in-person interview at http://www.davitahiresvets.com.